Plantscape began in 1973 and had an early major leadership role in ALCA,which was the nation’s largest contractor organization, with 2500 members. Our employees attended industry seminars to further their education and to sharpenservice skills. Carole Horowitz, our president, served as chair of ALCA’s Board of Governors for 4 years and helped develop the landscape industry’s certification program. 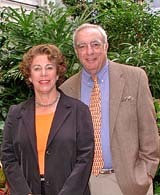 Don Horowitz served as chairman of ALCA's interior landscape division, and on ALCA’s Executive Committee for several years. He also developed and was chairman of the Plants for Clean Air Council. On January 1, 2005, the Associated Landscape Contractors of America (ALCA) and the Professional Lawn Care Association of America (PLCAA) joined forces to become the Professional Landcare Network (PLANET). This new network of green industry professionals is the green industry clearinghouse for information on educational events, legislative issues, membership, certification, and industry publications. PLANET is the international association serving interior plantscapers, lawn care professionals, exterior maintenance professionals, and design/build/installation professionals. In 2015, PLANET became NALP. The National Association of Landscape Professionals is the trade association for the landscape industry, representing the voice of more than 100,000 landscape professionals. Member companies specialize in lawn care, landscape design and installation, landscape maintenance, tree care, irrigation and water management, and interior plantscaping. Members also include students, consultants, industry suppliers, state associations and affiliate members.